Plan & Publish Your Photography. Argentum, London, 2006. 128 pp., back-and-white and color illustrations, 9½x10¼". Undertaking a personal project - it could be an article for a magazine, a book, a website, an exhibition or a commission - offers photographers an opportunity to focus their energies and ideas and broaden their horizons at the same time as developing their art and craft. This book, which aims to be both practical and inspirational, will take them through the thought processes and planning that must be undertaken before work commences and stressing the self-discipline that must be maintained if the final objective is to be successfully achieved. 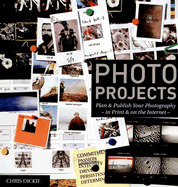 It also offers a wealth of first-hand advice based upon the experience of the author and more than 20 featured photographers. The book is heavily illustrated with relevant examples from project-based practice, captioned with quotations from the photographer about the genesis of the project, its objectives and realisation. The featured photographers are a mix of commercial, fine-art, documentary and funded photographers from the UK, USA and mainland Europe. Illustrations are in both colour and monochrome and selected to be relevant to the topic and tone of the section they appear in.